The Popo Agie River flowing down into the cave. Closeup of the Madison Limestone with the water flowing around it. 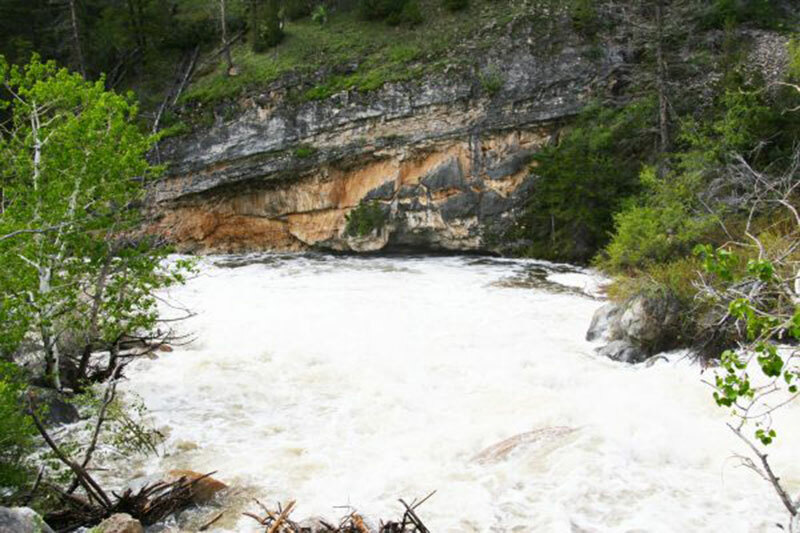 The Sinks cave completely full and overflowing during spring runoff. It is one quarter mile from the Sinks to the Rise aboveground. It would only take a few minutes for the water to make the journey to the Rise aboveground, but dye tests have shown that the water takes over two hours to make the journey. Geologists think that there are many winding underground passages the water has to work its way through before it bubbles back up at the Rise. It is possible the water underground mixes with water from other, smaller, sinks in the area. No one has explored very far into the sinks cave since the water passages narrow down to small cracks underground. Stories about people scuba diving from the Sinks to the Rise are just tall tales. The Sinks and Rise are in a very thick layer of limestone called Madison Limestone. This formation is very soft and easily eroded. It is likely that the Sinks and Rise themselves were created by the glaciers and are thousands of years old. The ice scraping down the canyon exposed the deeply buried Madison limestone and then the billions of gallons of water from the melting glaciers flowed into the soft rock formation creating the underground passages. The Sinks are still slowly eroding from the power of the river, but have changed little over the past one hundred years. Historic photos from 1903 show the cavern to be almost identical to today. 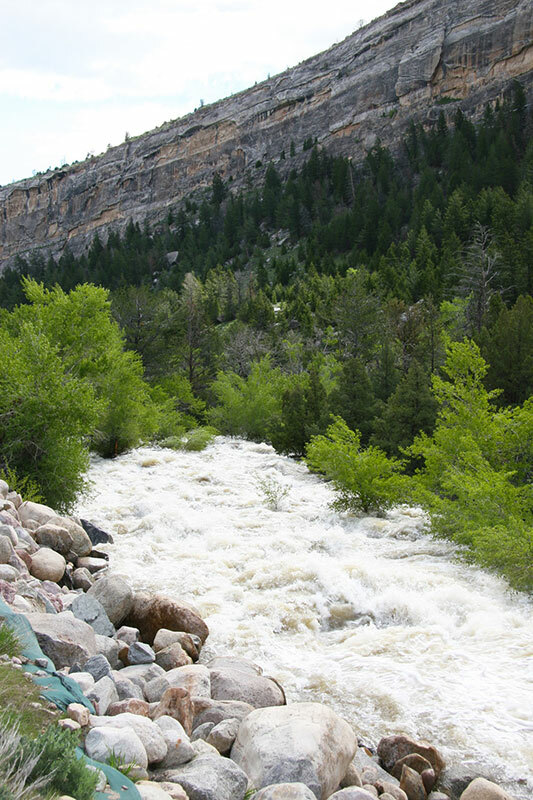 The amount of water flowing into the Sinks varies throughout the year. 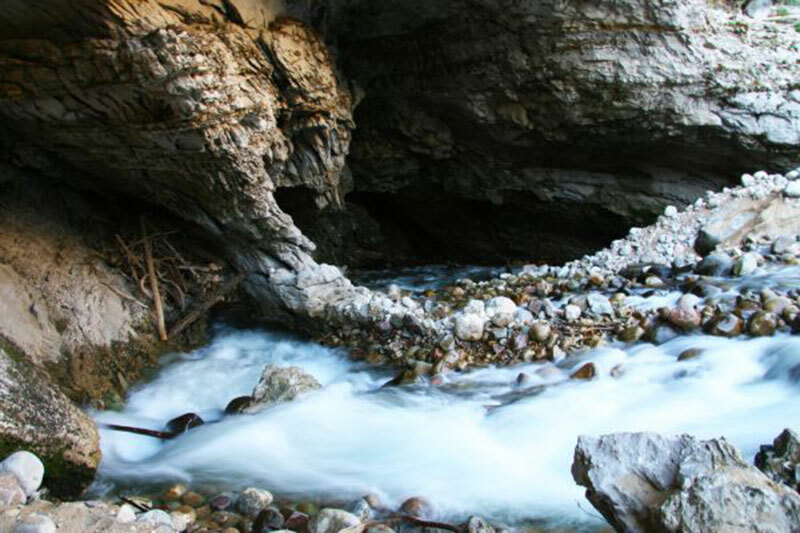 Most of the time much of the limestone cavern is exposed and all of the river’s water flows underground through the cracks and fissures in the rock. The average flow of the Popo Agie into the Sinks is about 100 cubic feet per second. 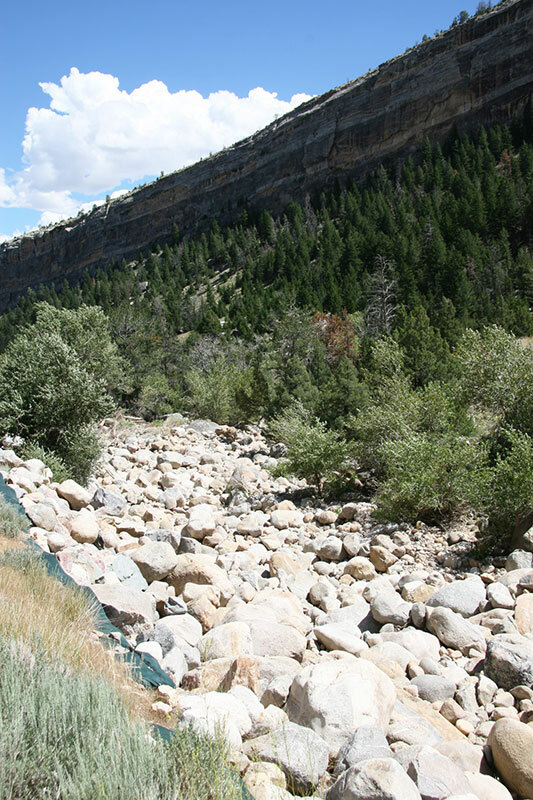 This level drops in the winter and jumps dramatically during spring runoff. 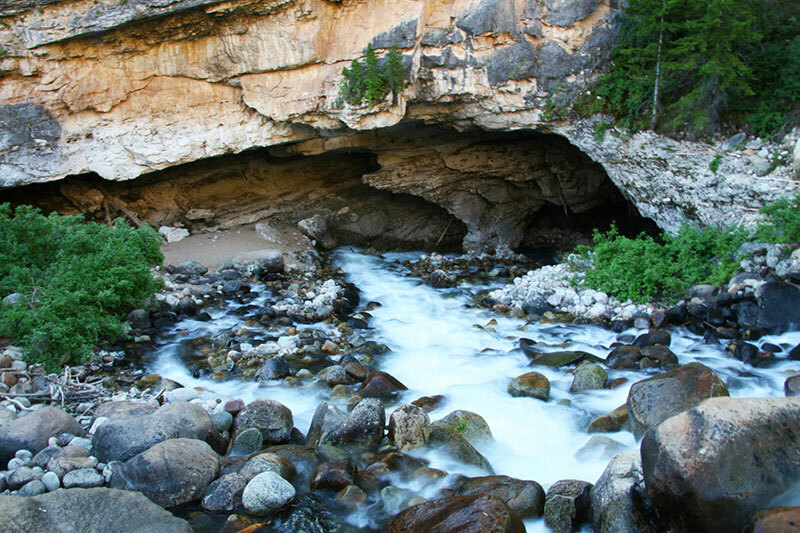 In late May and early June the river swells with melted snow from the mountains and the river fills the cavern completely. During runoff over 500 cubic feet per second of water flows into the cavern. 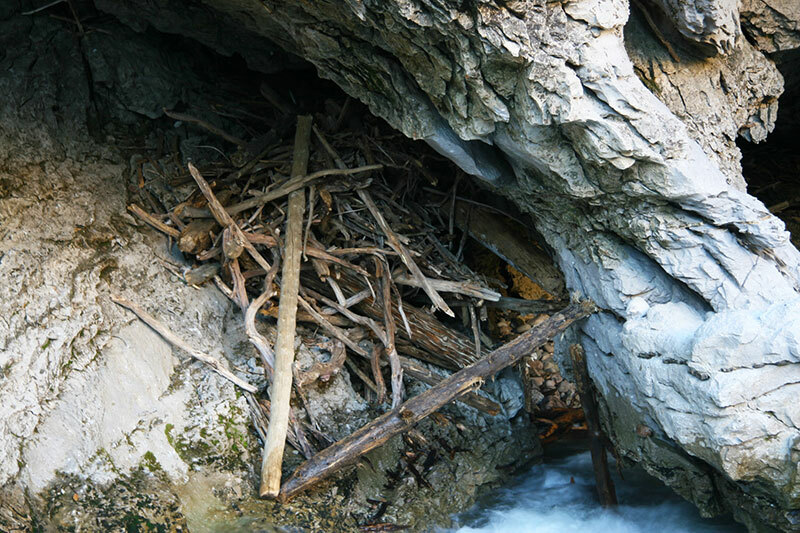 The water is so high that logs and driftwood are jammed into cracks in the ceiling of the cave - high above where people stand when the water is low. The cracks in the limestone cannot handle all this extra water and the excess spills over into a seasonal streambed called the overflow channel, to the left. Depending on how much snow is in the mountains, the Sinks can overflow from a few days to a few weeks. 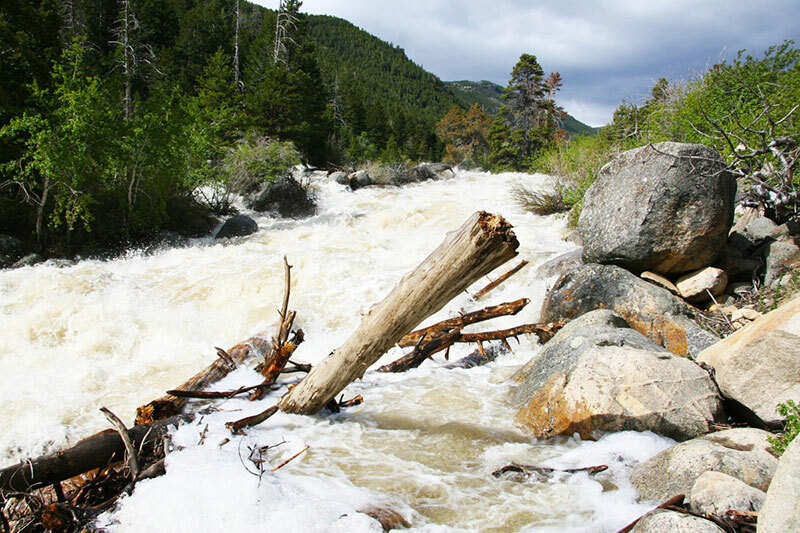 Every year during spring runoff there is water flowing both below and above ground between the Sinks and Rise. Most years the channel runs with water for about two weeks, but in very high water years (like 2010) the overflow can run over a month. During very dry years the overflow may run only a day or two. The overflow channel meets the regular river channel just below the Rise. 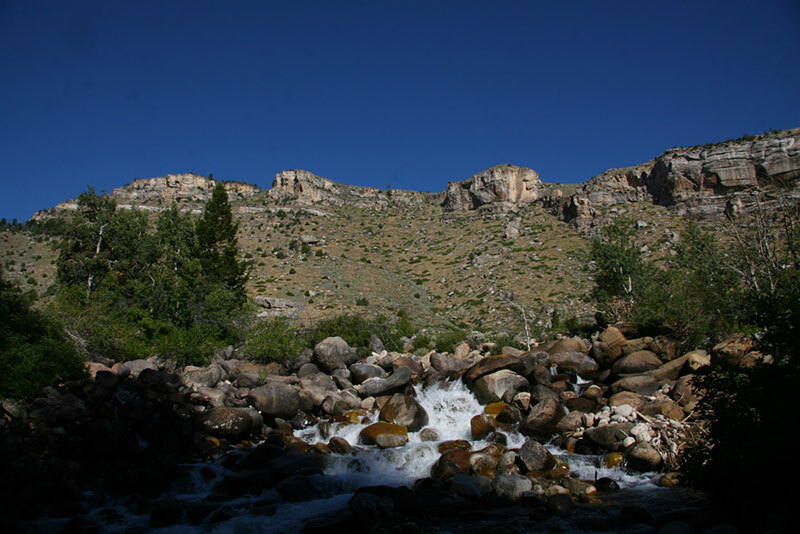 Much of the year it is dry and silent, and a wide variety of plants and animals live around the boulder strewn passage, attracted by the extra water left from spring run-off. There are many water rounded and eroded granite boulders in the channel. They were brought here over time from high in the mountains by the river’s flow. There is also sandstone, limestone and dolomite from the sedimentary formations in the canyon.